I have been seriously working on genealogy for Tom’s family and mine for over 15 years. My great-great grandmother is the inspiration for the book I am writing. Rachel Mendenhall Leap died when her youngest son, Absolom, was an infant. Just over 2 years ago I got an e-mail from a total stranger. She lives in Oregon, and had seen an old framed photograph for sale on Craigslist. It was in a storage unit in Oregon, and the renter had stopped paying the monthly rent. After whatever was the appropriate length of time, the storage owner emptied it out, and listed some of the items for sale. On the back of the frame was a hand-written note saying “My mothers father Absalum Reeves Leap died June 1885 William B. Snyder.” The e-mail sender linked family’s with heirlooms in the past and, because I had posted my family tree online, she sent me the link. Tom bought it for my birthday. He told the seller to have it professionally packed to ship. Packaging and shipping cost more than the picture, but it was worth every penny. To make it even better, my Aunt Sara remembers it on her grandmother’s, Absalom wife’s, wall. My grandmother was 18 months old, her sister was not yet born, when Absalom died. In 1885. 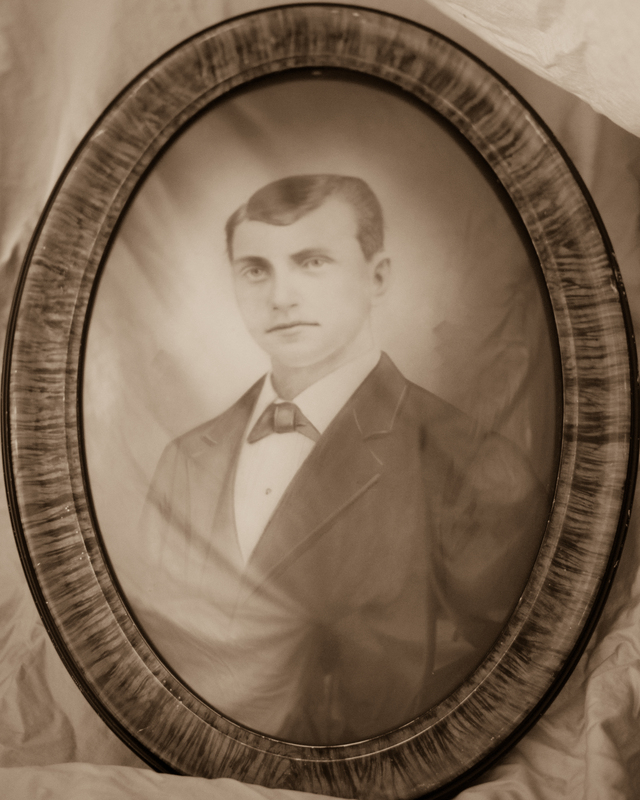 My great-aunt’s husband and son were both named William Snyder. I offered to let Aunt Sara hang it on her wall, she was just happy that I had it. For her 91st birthday, my son Ben took a picture of it, which I framed a small oval frame. My sister hung the copy on her wall. After130 years, it has come full circle. This entry was tagged family, genealogy, Internet, photographs. Bookmark the permalink.